In today’s competitive market you generally tend to get what you pay for. Don’t make the mistake of buying cheap inferior ribbons. One ribbon looks pretty much like the next but the difference in quality is indiscernible to the naked eye yet can have drastic effects on both your printheads and print quality. Print quality and legibility contribute to the reputation of both your products and your company. That is why you need reliable consumables designed to withstand industrial environments and capable of high-resolution prints. ALS Labelling Solutions team have been specialising in labelling technology for a long number of years. Take advantage of our experience to help you with your requirements. We can provide you with the perfect film adapted to all types of printers for the most demanding applications. AS1A Premium Flathead Wax ribbon, finished to suits all required Thermal transfer Label printers. 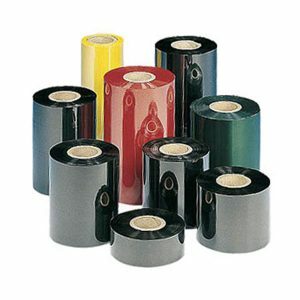 AS1B Premium Flathead Wax/Resin ribbon, finished to suits all required Thermal transfer Label printers. AS1C Premium Flathead Resin ribbon, finished to suits all required Thermal transfer Label printers. AS2B Premium Nearedge Wax/Resin ribbon, finished to suits all required Thermal transfer Label printers. AS1C Premium Nearedge Resin ribbon, finished to suits all required Thermal transfer Label printers.